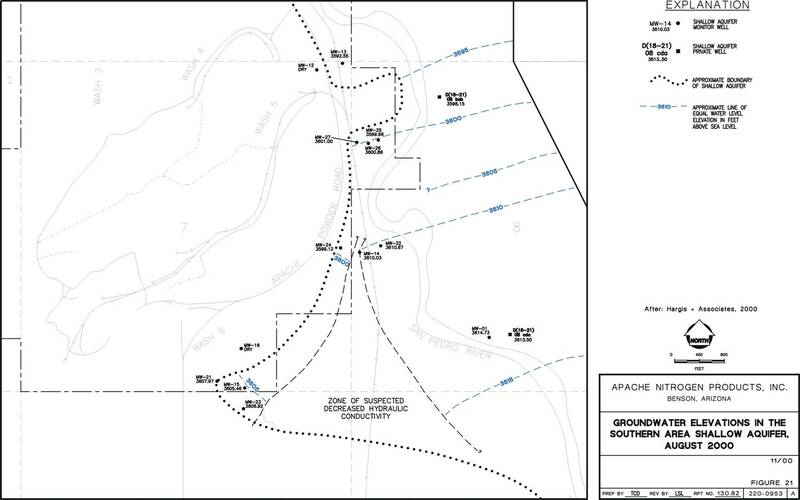 The Apache Powder Superfund Site (APSS), located south of Benson AZ, is the location of a combined perchlorate/nitrate plume within the shallow aquifer located adjacent to, and east of, the Apache Nitrogen Products, Inc. (APN) production facilities and former wastewater percolation ponds. 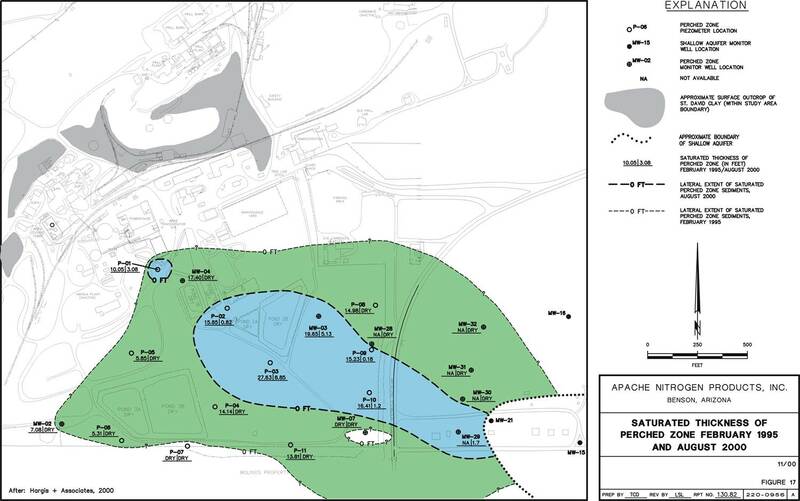 The Saint David Clay (SDC) forms a regional "bedrock" aquitard complex that underlies the APN facilities and percolation ponds, the nearby San Pedro River (SPR), and forms the highlands bordering the east and west sides of the SPR riparian district. Besides underlying the shallow aquifer, the SDC also underlies a shallow perched zone that is located beneath the percolation ponds into which paleochannels had been eroded and then subsequently buried by newer alluvium, prior to the construction and operation of the APN percolation ponds. The perched zone is somewhat elevated with respect to the nearby shallow aquifer. 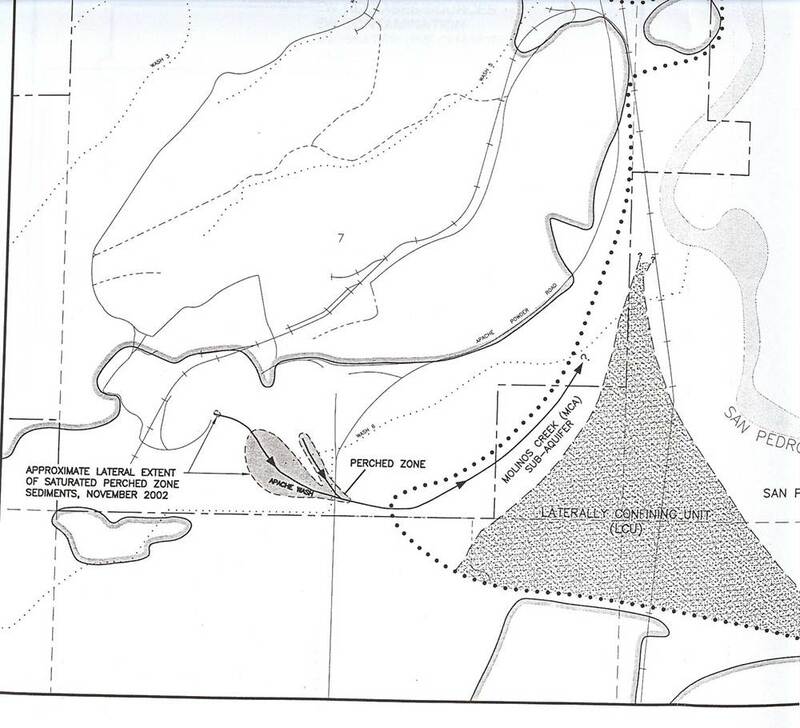 Figure 1 (see link below) shows the locations of the former wastewater percolation ponds. Figure 2 shows early February 1995 shallow aquifer groundwater elevations (piezometry) prior to the cessation of wastewater discharge to the percolation ponds. For reference, the former percolation ponds and underlying perched zone are generally located between the faint "Wash 6" and railroad spur markings, whereas the dotted line indicates the western boundary of the shallow aquifer over which the SPR flows northward. Figure 3 shows the significant piezometric drop within the extreme western portion of the shallow aquifer by November 1996, after cessation of wastewater discharge to the percolation ponds during late February 1995, which is specifically shown in the change in the location and curvature of the 3610-foot groundwater elevation line within this portion of the shallow aquifer. The southwest bend in this line indicates that artifical groundwater recharge to this portion of the shallow aquifer had occurred via past wastewater discharge to the percolation ponds, followed by eastward outflow of percolated wastewater (now perched zone groundwater) via the perched zone paleochannels to the shallow aquifer. By November 1999, the piezometric surface of the extreme western portion of the shallow aquifer continued to drop significantly, resulting in the appearance of unexpected piezometric surface "depression" within the shallow aquifer adjacent to the perched zone (Figure 4). At that time, these apparent depressions could not be explained by pumping wells or other common activites. As part of his MS thesis while working at Hargis+Associates, Inc. in Tucson AZ, Mr. Deane reviewed the logs of numerous soil borings and groundwater monitoring wells that had been drilled through the shallow aquifer and perched zone into the underlying SDC. 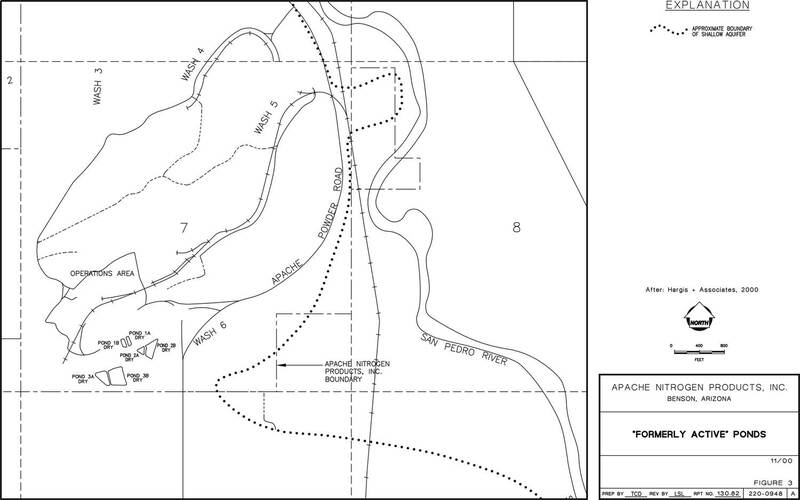 Using observed local surface outcrops of the SDC, Mr. Deane re-worked the local topography of the underlying SDC and theorized that previously unforeseen paleochannels had been eroded into the SDC underlying both the perched zone ("Apache Wash") and the western portion of the shallow aquifer ("Molinos Creek") (Figure 5). A raised portion of the SDC topographic surface was indicated to exist between the Molinos Creek paleochannel and the much larger ancestral SPR paleochannel to the east (not shown). Using his knowledge of sedimentary geology, Mr. Deane further theorized that fine-grained lateral accretions had been deposited on the raised portion of the SDC topographic surface between the Molinos Creek and ancestral SPR paleochannels during paleohistorical flood stages, while sands and gravels had been deposited at the same time within the paleochannels, forming the separated portions of the shallow aquifer. Deposition of the lateral accretions formed a "lateral aquitard", initially named the "Zone of Suspected Decreased Hydraulic Conductivity" (Figure 6). This feature was later re-named the "Laterally Confining Unit" (LCU) in the final version of the thesis and subsequent project documents that were submitted to USEPA Region 9 (Figure 7). 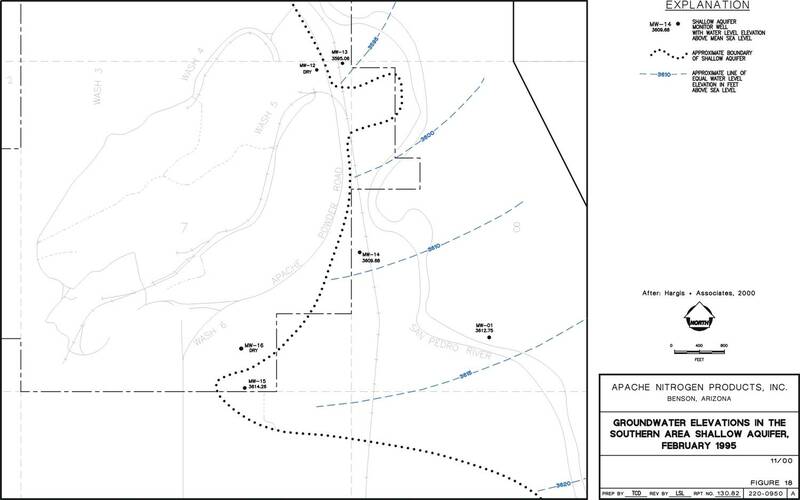 The LCU significantly reduced lateral groundwater recharge from the main portion of the shallow aquifer to the narrow, smaller "Molinos Creek Sub-Aquifer" which forms the western portion of the greater shallow aquifer, east of and adjacent to APN. In addition, groundwater flow from the perched zone to the Molinos Creek Sub-Aquifer occurred via the Apache Wash (Figure 7). Thus, when wastewater discharge to the percolation ponds ceased, groundwater recharge to the Molinos Creek Sub-Aquifer via the buried perched zone paleochannels that had been eroded into the SDC essentially ceased soon after. This resulted in the closed piezometric "depressions" previously shown on Figure 3 within the Molinos Creek Sub-Aquifer paleochannel, as well as the significant reduction of the thickness and lateral extent of perched zone groundwater between February 1995 (larger green area) and August 2000 (smaller blue area) as shown on Figure 8. 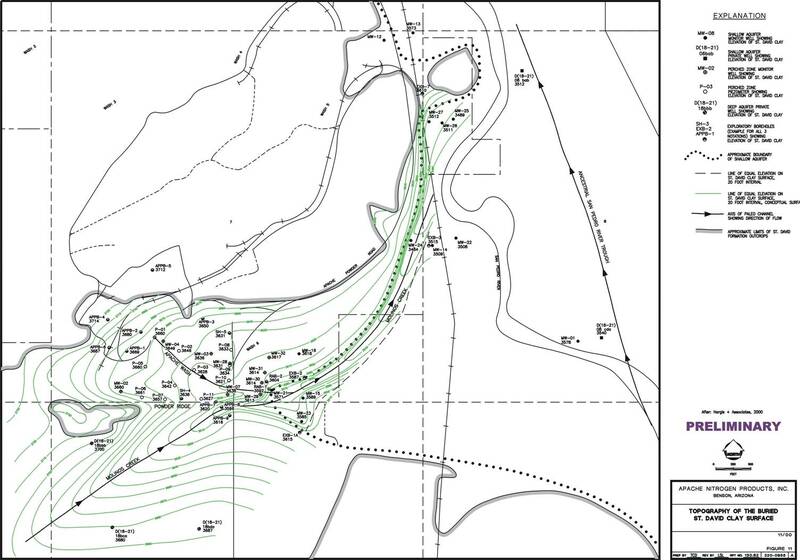 The LCU allows the hydraulic separation of piezometric data within the two new portions of the shallow aquifer as shown on Figure 6. This theory is supported by long-term hydrographs of the wells installed within the perched zone, Molinos Creek Sub-Aquifer, and the greater shallow aquifer, as well as hydrochemical data, all of which were included within the final version of the MSc Thesis. Subsequent exploratory borehole drilling required by EPA Region 9 confirmed the presence of the LCU, confirming the theory as fact. A secondary benefit of the LCU is the apparent lateral confinement of the perchlorate/nitrate groundwater contaminant plume extending from the perched zone into the shallow aquifer. Instead of extending outward into the greater shallow aquifer to an unknown distance as previously believed, the plume appears to be laterally confined within the relatively narrow Molinos Creek Sub-Aquifer, which may translate into significant remediation cost and time savings. RESULT: The "narrowing" of the nitrate/perchlorate plume along the western boundary of the Shallow Aquifer allowed the client to consider remedial measures that may require a smaller number and array of wells, thus potentially reducing long-term O&M costs. Mr. Deane appreciates the opportunity to have worked with Dr. Leo Leonhart PhD and the staff of Hargis+Associates, Inc., Tucson AZ, while developing his MSc thesis.